One thing most people living with autism experience is sensory sensitivity. Sounds and lights that are too intense can be deeply disturbing. Too much activity, too many people, a pace of talking that's too fast, all add up to sensory overload. Fourteen-year-old Trever Arnold, also known as Treverini the Magician, was diagnosed with autism at the age of six, old by today's standards, when children are often diagnosed much younger. He is one of around 155,000 people in Georgia and 3.5 million people nationwide living with autism. At the time, says his mother, Patti Arnold, there were few resources in the Northwest Georgia area. "We had to go to Atlanta or Nashville. Trever became aware of the problem when he was in the fourth grade and wanted to do something about it." That's when the dream of Peaceful Pieces Sensory Center was born. The center does not have its own building yet, but the 501(c)(3) non-profit has been conducting events for four years. Arnold, the event planner for the group, arranges activities especially suited to autistic children and designed for fun and teaching skills. One time they took a group of children on an ice cream and scavenger hunt outing. "The kids ordered their own ice cream," says Arnold, "and the scavenger hunt helped them learn how to interact and work with one another. We choose uncrowded locations for outings and keep the pace comfortable for everyone." Peaceful Pieces is a resource not only for autistic children, but for those with sensory processing disorders, ADHD and other special needs. a social worker and Trever's older sister. She says on the group's website, "It was not until my younger brother was diagnosed with autism that I realized how few resources our community had to meet his needs. He participated in as many resources as he was able to, but somewhere there was a gap. We had no training, only insight to learn from him and do our best. Families in our area are experiencing this same need every day. My brother has become an amazing young man that I am so proud of. He has felt a strong desire to give back to those who see the world the same way he does and to support their families." Lowe says her brother made a birthday wish "that there be a place where everyone is welcomed, loved and accepted." "If one young man can give so much to his community," Lowe says of Trever, "we can all work together to make life a little more enjoyable for others in these situations." On April 13, Peaceful Pieces will hold their fourth annual "Laps of Love" fundraising event on the Ringgold High School football field. The public is invited to attend, walk or run laps, mingle and socialize. There will be inflatables for children, food vendors, and activity tables especially geared toward those with sensory sensitivities but also fun for all. Magician Michael Frisbee will be doing a show, and Treverini will also be performing. There is no cost to attend or walk or run, but donations are welcome. Peaceful Pieces is looking for sponsors for the event and offers several levels of sponsorship. They are also looking for businesses, non-profits and healthcare providers who would like to set up booths at Laps of Love. When: April 13, 10 a.m.-1 p.m.
Attendees watch, listen and take notes as Julie Carter presents the Thriving Communities concept for LaFayette. Participants wrote on post-notes what they saw as the city's identifiable assets and what they would like to see and develop as aspirational assets. 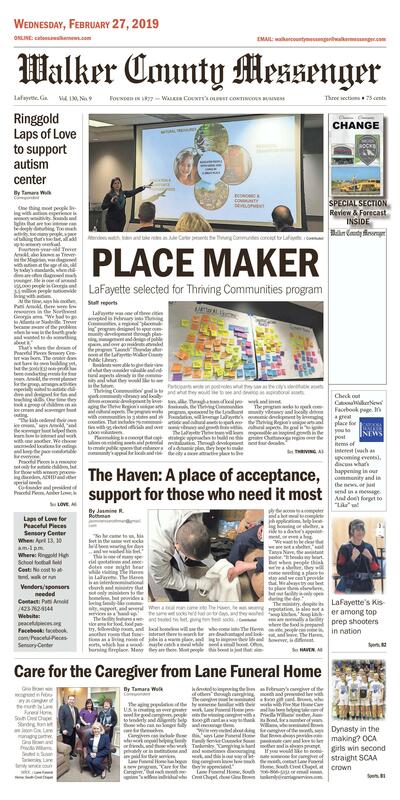 LaFayette was one of three cities accepted in February into Thriving Communities, a regional "placemaking" program designed to spur community development through planning, management and design of public spaces, and over 40 residents attended the program "Launch" Thursday afternoon at the LaFayette-Walker County Public Library. Residents were able to give their view of what they consider valuable and cultural aspects already in the community and what they would like to see in the future. Thriving Communities' goal is to spark community vibrancy and locally-driven economic development by leveraging the Thrive Region's unique arts and cultural aspects. The program works with communities in 3 states and 16 counties. That includes 79 communities with 95 elected officials and over 1,600 volunteers. Placemaking is a concept that capitalizes on existing assets and potential to create public spaces that enhance a community's appeal for locals and visitors, alike. Through a team of local professionals, the Thriving Communities program, sponsored by the Lyndhurst Foundation, will leverage LaFayette's artistic and cultural assets to spark economic vibrancy and growth from within. The LaFayette Thrive team will learn strategic approaches to build on this revitalization. Through development of a dynamic plan, they hope to make the city a more attractive place to live work and invest. The program seeks to spark community vibrancy and locally driven economic development by leveraging the Thriving Region's unique arts and cultural aspects. Its goal is "to ignite responsible an inspired growth in the greater Chattanooga region over the next four decades." That begins with each community examining where it is, what assets it has, and where it wants to go. It includes harnessing and making the most of economic opportunities and means providing "educated people with good jobs living in a great place." In short, it means ensuring that the local economy is strong enough to ensure that everyone who wants employment can find jobs here. Other cities accepted into the Thriving Communities creative placemaking program for 2019 are Bridgeport, Alabama, and Dayton, Tennessee. Cities and towns from a three-state, 16-county region are eligible to apply with teams representing various backgrounds and roles within their communities. The teams are selected by a committee of professionals in the fields of urban planning, arts, culture, and philanthropy. "Each of these teams exhibited a strong desire to build upon their unique strengths and to leverage the input and talent of their local citizens for long-term growth and prosperity," said Bridgett Massengill, President and CEO of Thrive. "We are excited to bring these three communities into the growing network of Thriving Communities across our tri-state region." City Manager David Hamilton said, "This is the beginning of a 10-month exercise, and we would love and encourage continued community engagement in future events." The LaFayette, Georgia A Thriving Community group can be located on Facebook. Future community events will be posted on two websites: LaFayette Thriving Community and LaFayette Downtown Development. When a local man came into The Haven, he was wearing the same wet socks he'd had on for days, and they washed and treated his feet, giving him fresh socks. The food pantry is for those who need a one-time emergency three-day supply, and is otherwise used for the food-delivery service they provide for elderly shut-ins. The facility has a space with a couch and chairs in the same room as a wood-burning fireplace. The facility provides blankets, coats, socks, and underwear for those who need them. "So he came to us, his feet in the same wet socks he'd been wearing for days ... and we washed his feet." The facility features a service area for food, food pantry, fellowship room, and another room that functions as a living room of sorts, which has a wood-burning fireplace. Many local homeless will use the internet there to search for jobs in a warm place, and maybe catch a meal while they are there. Most people who come into The Haven are disadvantaged and looking to improve their life and need a small boost. Often, this boost is just that: simply the access to a computer and a hot meal to complete job applications, help locating housing or shelter, a ride to a doctor's appointment, or even a hug. "We want to be clear that we are not a shelter," said Tanya Nave, the assistant pastor. "It breaks my heart. But when people think we're a shelter, they will come needing a place to stay and we can't provide that. We always try our best to place them elsewhere, but our facility is only open during the day." The ministry, despite its reputation, is also not a "soup kitchen." Soup kitchens are normally a facility where the food is prepared on-site, people can come in, eat, and leave. The Haven, however, is different. "You don't just get to come in, get a hot meal, and leave," Nave said. "If you're simply coming for a meal, we will send you with a sandwich and chips. You have to be coming here for other help to receive the hot fellowship meal. Many people come in for the bologna sandwich and chips, until they feel they can trust us. Once they do come in for other assistance, we are more than glad to provide a hot meal and the assistance you need." The Haven does meal delivery once a week for LaFayette residents who are elderly and shut-in, also providing easy-to-open foods (with items like poptop cans) for those who are disabled and have mobility needs. In addition to these services, the ministry has an addiction counselor on site. It holds Narcotics Anonymous meetings, as well as support for recovering addicts. "We don't assist anyone with jobs or housing without a passing drug test," Nave said. "But once you're here, if you come in and tell anyone in this room that you're feeling like you might relapse, you'll have a whole community talking you down and showing their support for you." The people in this community hold each other up when they are weak. People who successfully rebuilt their lives often return and check in with Nave, some of them even referring to her as "mom." There are many families who have dug themselves out of the trenches with The Haven's help. When a man walked into the facility needing assistance, Tanya's response was simple. "We have a warm fireplace going," she said. "Look for the smoke from the chimney. You'll find us." Gina Brown was recognized in February as caregiver of the month by Lane Funeral Home, South Crest Chapel. Standing, from left are Jason Cox, Lane managing partner, Gina Brown and Priscilla Williams. Seated is Susan Tankersley, Lane family service counselor. The aging population of the U.S. is creating an ever greater need for good caregivers, people to tenderly and diligently help those who can no longer fully care for themselves. Caregivers can include those who work unpaid helping family or friends, and those who work privately or in institutions and are paid for their services. Lane Funeral Home has begun a new program, "Care for the Caregiver," that each month recognizes "a selfless individual who is devoted to improving the lives of others" through caregiving. The caregiver must be nominated by someone familiar with their work. Lane Funeral Home presents the winning caregiver with a $100 gift card as a way to thank and encourage them. "We're very excited about doing this," says Lane Funeral Home Family Service Counselor Susan Tankersley. "Caregiving is hard and sometimes discouraging work, and this is our way of letting caregivers know how much they're appreciated." Lane Funeral Home, South Crest Chapel, chose Gina Brown as February's caregiver of the month and presented her with a $100 gift card. Brown, who works with Five Star Home Care and has been helping take care of Priscilla Williams' mother, Juanita Bond, for a number of years. Williams, who nominated Brown for caregiver of the month, says that Brown always provides compassionate care and love to her mother and is always prompt. If you would like to nominate someone for caregiver of the month, contact Lane Funeral Home, South Crest Chapel, at 706-866-5151 or email susan. tankersly@carriageservices.com.